Sun pillars change as the sun descends. At first the lower pillar is strongest but as the sun descends the upper pillar grows taller and brighter. The subhorizon components are visible in nearby diamond dust, from mountainsides or from aircraft. 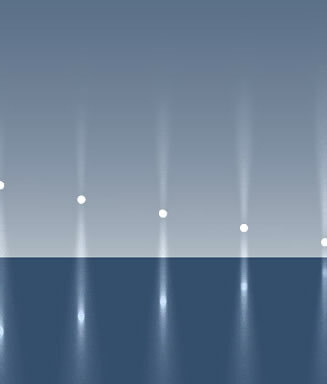 Simulations by HaloSim; plate crystals of various tilts**, 10 million rays traced per pillar. 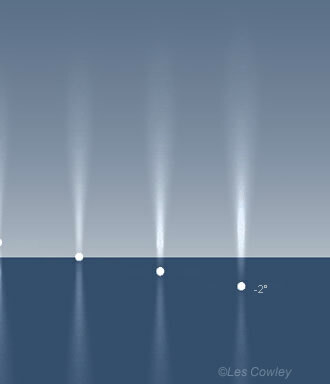 Upper pillars are short and faint when the sun is a few degrees high. The sun needs to reflect off the underside of plate crystals to make an upper pillar and when its rays are slanting downwards a few degrees, only strongly tilted crystals have their lower faces lit. In contrast, sunlight easily shines on upper faces and so the lower pillar is strong. Most of the lower pillar is of course beneath the horizon. The subsun - at the same distance below the horizon as the sun is above it - is especially bright. As the sun sinks, the upper pillar lengthens and brightens. At sunset both pillars are equal. After the sun has set it still illuminates high clouds in the west. These almost horizontal or even slightly upward going (from atmospheric refraction) rays illuminate the lower crystal faces. They reflect downwards to form a strong upper pillar. Watch a pillar strengthen after sunset (the reduced glare and skylight also helps make the pillar more apparent) and creep slowly northward following the sun hidden below the horizon. Large crystal tilts produce tall pillars but the distribution of tilts also affects pillar appearance. Crystals in the simulation had a uniform distribution of tilts up to ±3° from horizontal then tailing off so that a few crystals had tilts of ±6°. Other tilt distributions produce pillars of different appearance. Try it in HaloSim.